Assemblymember Amy Paulin is sponsoring her third annual “There Ought to Be a Law” contest for students in grades six to eight throughout the 88th Assembly District. 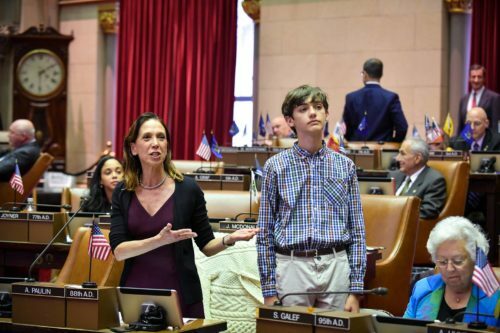 Pelham Middle School student Jakob Ferrara being recognized on the floor of the New York State Assembly for winning the “There Ought to Be a Law” Contest. Jakob Ferrara from Pelham Middle School was last year’s contest winner. The then seventh-grader was awarded first place for his proposal to mandate free Pre-K for all 4-year olds in New York state, giving all students the advantage of early learning. All contest submissions are due by April 1. The students whose proposals are selected will be notified on April 15, with the first-place winner taking a trip to Albany sometime in late May or early June. Interested students need to write an essay (750 words maximum) detailing their proposed idea for a law. There are no limitations on what a student can recommend. Creativity is encouraged. Students can either download the entry form as a PDF or fill it out online. Middle school principals, teachers, and staff can contact the district office for more information by either calling (914) 723-1115, or by emailing paulina@nyassembly.gov. Any inquiries or submissions should be directed to Lisa Hofflich.